Have you ever been curious as to what it takes to receive a CDC award? Individuals and organizations (nonprofit and for-profit) are invited to submit entries for individuals, businesses or groups for their outstanding achievement in the following categories. We encourage you to submit a nominee in as many categories as appropriate; however, each individual or organization may enter only one nominee per category. A distinguished panel of judges comprised of the following categories: chefs, community leaders, philanthropists, past Honorees and nonprofit professionals from the community evaluate the nominee submissions. The candidate’s membership status must be an Active member, in good standing, for not less than 3 years, in the ACF Chefs de Cuisine Association of San Diego, Ca., Inc. Must currently hold or have held, the position of Executive Chef, working Chef or Pastry Chef. Former Chapter Chef of the Year recipients cannot be re-nominated for the ACF Chapter Chef of the Year of the Chefs de Cuisine Assn of San Diego for 7 years. Candidates cannot receive the award more than twice in a lifetime. Chefs de Cuisine Association of San Diego candidates who were nominated but failed to win in previous years can be re-nominated for the current year. Nomination should be based on the candidate’s active participation and involvement, relating to the achievements of Chefs de Cuisine Association of San Diego during the past years. Personal monetary donations will not be considered. Nominations will be accepted in writing or electronic vote only, from Senior Members, Professional and Culinarian Members of the Chef de Cuisine Association of San Diego, in good standing. The candidates can be selected from a wide pool of candidates from the CDC Chapter members, other ACF Chapter members and local chefs. Candidates must have supported and displayed a commitment to the ACF Chefs de Cuisine Assn of San Diego, community and culinary industry. Former Chapter Chef of the Year recipients cannot be re-nominated for the local Chapter Chef of the Year of the Chefs de Cuisine Assn of San Diego for 7 years. Candidates cannot receive the award more than twice in a lifetime. 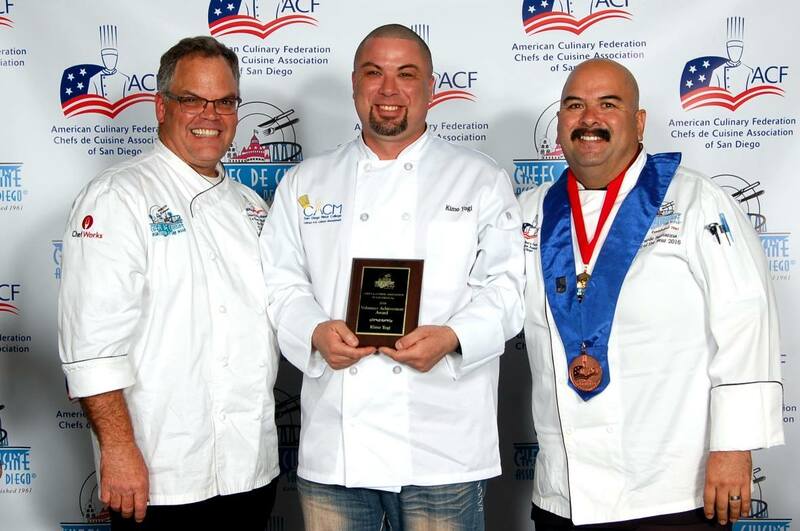 The candidate’s membership status must be an Active member, in good standing, for not less than 3 years, in the ACF Chefs de Cuisine Association of San Diego, Ca., Inc. Must currently hold or have held, the position of a full time Culinary Instructor at an accredited secondary or post-secondary school. 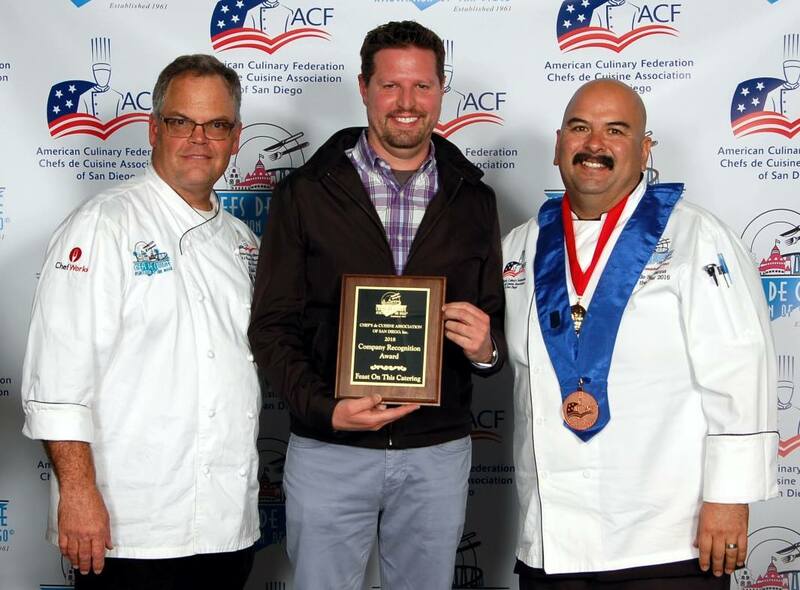 Former Chapter ACF Chef Educators of the Year recipients cannot be re-nominated for the ACF Chapter Chef Educator of the Year of the Chefs de Cuisine Assn of San Diego for 7 years. Candidates cannot receive the award more than twice in a lifetime. Nomination should be based on the candidate’s active participation and involvement, relating to the culinary educational achievements of the culinary students under their instruction. Eligible candidates will be notified by email 2 months prior to the COTY awards dinner. Nominations will be decided by the Chef of the year committee. Candidates must submit their resume and bio for consideration of the award. The candidates can be selected from a wide pool of candidates from the CDC Chapter members and other local culinary schools. Candidate must be an ACF member in good standing of the Chefs de Cuisine Assn of San Diego. Candidate must be a full time student at an accredited secondary or post-secondary culinary program. Must have passing grades in school. Candidate cannot receive this award more than once. Candidate can be selected from a wide pool of applicants (members will be considered first). A company that has stood out during the year and supported our organization on any level. Any individual, member or non-member, that has went above and beyond in supporting our organization. Any volunteer that has stepped up and volunteered on numerous events throughout the year. Any individual that the President finds worthy of this special medallion. It is truly an honor for The Chefs de Cuisine Association of San Diego to recognize the outstanding contributions made by all our honorees. The tireless efforts of these individuals, organizations and businesses have directly helped countless people and improved the quality of life for everyone in the culinary community.